Train Town Toy & Hobby is your best source for train sets, engines, rolling stock, railroad accessories, train books and videos. First-time purchasers looking for a ready to run train set or seasoned train buffs with more sophisticated needs can get help from our knowledgeable sales staff. 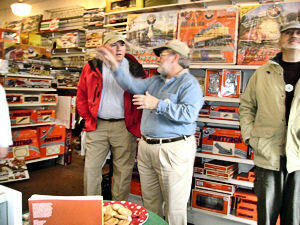 We are an authorized dealer for Lionel and MTH-RailKing, and we carry O-scale products by Williams and Atlas.. Looking for HO-scale and N-scale sets, cars and accessories? 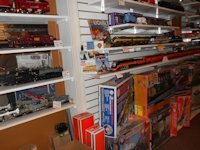 Look to us for Bachmann, Athearn, and Atlas items among other well-known manufacturers. Always available are current and retired road names including Norfolk Southern, CSX, Amtrak, Southern and Atlantic Coast Line. For the discerning train collector, Train Town is known for its display of specialty trains that are made up of sometimes hard-to-find engines and cars, something not typically found in hobby stores. Specialty trains can include freight, military, and passenger trains.